When a client came in to the office to discuss a vintage Aston Martin DB2 he had acquired, my first thought was that he had bitten off more than he could chew. 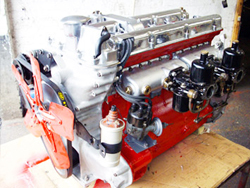 He knew that it needed a complete engine rebuild and I knew that a lot of the new parts which would be required would be difficult, if not impossible to source. 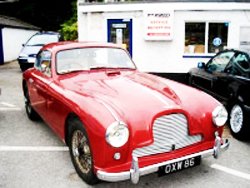 As the conversation progressed, it became clear that he was under no illusions as to the cost of restoring a vintage car and was in no rush, preferring to do the job properly from the outset. He realised that some parts would need to be manufactured from scratch and was delighted to hear that we would not be daunted by this challenge. For my part I was transported back in time to when we built our own cars for racing and even earlier to my apprenticeship in a machine shop. Nostalgia got the better of me, and we agreed to dust off the lathe and get started! After extensive internet research, a surprising amount of the required parts were still available and the rebuild was underway. The bottom end was completely disassembled and cleaned, the crank was sent off for regrinding and new con rods and pistons duly arrived. The crankshaft on a straight 6 engine is an impressive piece of engineering, converting the up and down movement of the pistons into the smooth rotational energy needed to drive the wheels via the clutch and gearbox. The shaft needs to be strong enough to transmit the full engine torque, yet has to be machined to tolerances of less than a thousandth of an inch to prevent clatter. Vital to any engine, is maintaining synchronisation between the crankshaft and the camshaft(s), not only to optimise performance, but critically to prevent catastrophic collisions between pistons and valves. 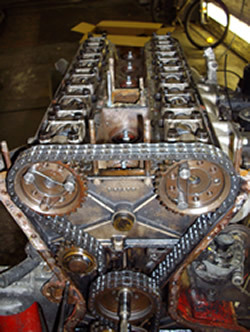 In the Aston's Lagonda engine this is achieved with the seriously rugged duplex timing chain shown in the picture. Modern fabric based timing belts, whilst lighter and quieter, have to be replaced at regular intervals and failure to do so has landed countless motorists with eye watering repair bills. No concerns for our client on that front, this chain would keep his camshafts turning all the way to the moon, and probably back again! The DB2 was a revolutionary design with twin overhead cams on a straight 6 block, a big improvement over the 4 cylinder push-rod engine used in the DB1. The engine had not been turned over for many years and we were concerned that the valve seats might have been damaged beyond repair. The camshafts were removed with some trepidation and the valves eased out and to our surprise the seats were not too bad. New valves were one of the surprisingly available new parts and these were painstakingly lapped into the freshly skimmed head. Meanwhile, the block had been meticulously examined for any signs of ridges or scoring. We had expected to have needed to send it away for a rebore, but were amazed to find it was in virtually mint condition. 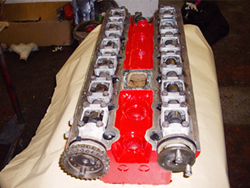 The engine was all reassembled, with new belts, chromed covers and posh paintwork, and was initially turned over by hand. When everything seemed smooth we inserted the new plugs and lowered it back into the engine bay. Once all the ancillaries had been reassembled, we were finally ready to give it a test and the entire staff stood around. To everyones satisfaction (and relief) it started almost instantly and purred like a (rather large) kitten! With the suspension rebuild which had been undertaken in parallel, the owner drove away very happy.